m. Margery Colborne (John of Ballintubber) 1715 ref. m. Sarah Kenah (Robert Kenah and Mary Williams of Castlemartyr) 1756 ref. m. Anne Garde (b. ~ 1757; Thomas of Dunfort, Jane Walter) 1784 ref. James d. June 10, 1848 ref. Will witnessed Dec. 31, 1822 Springfield, co. Cork; sealed by widow at Castlemartyr, Jan. 16, 1823 and proven Jan. 31, 1823.
m. Margaret Drury (dau. of Squire of Bildacary ?) 1794 ref. 3.2.3.2.2.1 Anna Mary Garde b. ? 3.2.3.2.2.2 Henry Walter Garde M.D. b. ? 3.2.3.4 Anne Boles m. Richard Davis 1790 ref. Samuel d. May 14, 1770 (fall from his horse) ref. 3.2.4 Mary Boles m. John Floyd 1742 ref. 3.2.6 Elizabeth Boles m. William Garde (William Garde, Mary Goold) 1750 ref. 3.3.1 Jonathan Boles (John in baptismal register) bp. 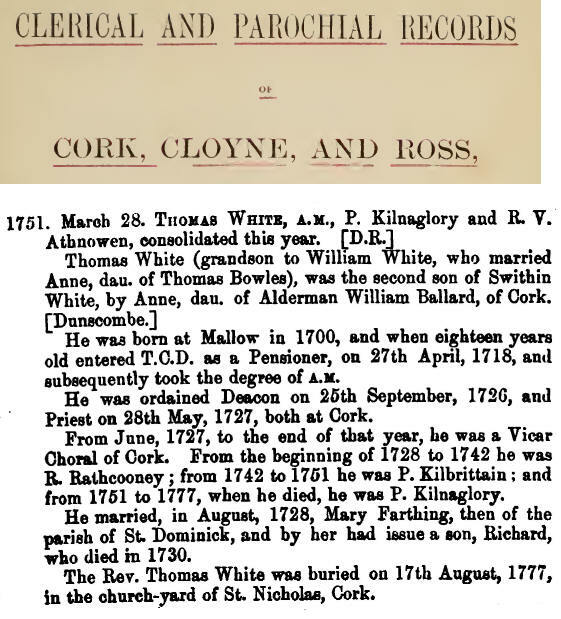 Feb. 13, 1717/18 Lismore Cathedral ref. m. Jane Brown ref. (lived Tallow, co. Waterford) 1747 ref. 3.3.1.1 Elizabeth Boles b. 1749 bp. Feb. 5, 1749 Castletownroche, Cork ref. 3.3.1.2 Walter Croker Boles b. 1751 bp. July 17, 1751 Castletownroche, Cork ref. 3.3.1.2.1 Walter Boles bp. 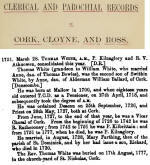 Feb. 21, 1781 St. Mary’s, Clonmel ref. Mary d. Nov. 1811, bur Nov. 24, 1811 St. Mary's Clonmel (possibly) ref. 3.3.1.3 Martha Boles b. 1756 bp. July 13, 1756 Castletownroche, Cork ref. 3.3.2 Thomas Boles bp. Sept. 27, 1719 Lismore Cathedral ref. Grace inherited Aghern and passed it on to her sister and later it was sold. (lived Rosanna, co. Cork; Lieut. Gen. Army; Col. 83rd Reg. m. Lieut. Henry Palmer, 68th Reg. which marriage does the following refer to? 15/11/1823 John Corbyn married Ahern church, Tallow to Sophia Bowles, the daughter of the late Geo.Bowles, Mount Prospect, Cork. m. Henry Wigmore of Ballyvodock, co. Cork, Gent. ref. 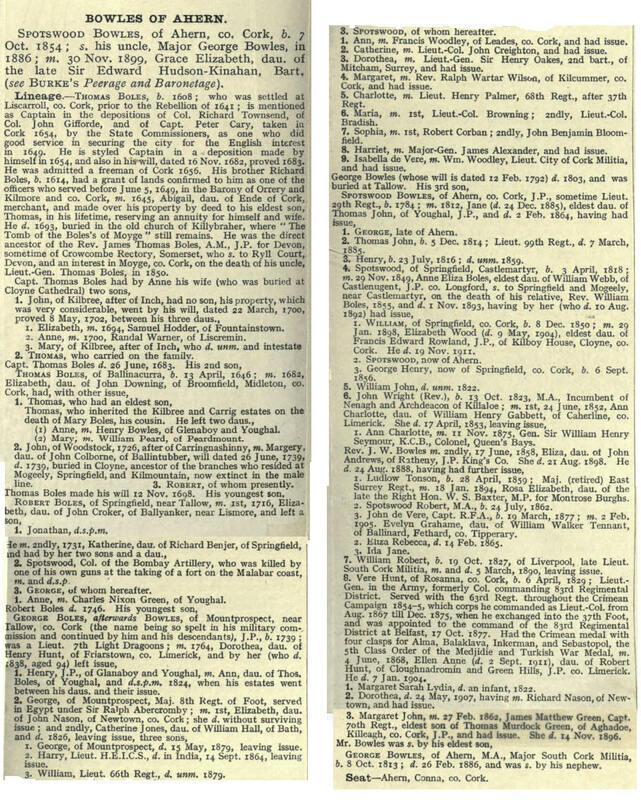 5.1 Swithin White m. Anne Ballard (Alderman William Ballard of Cork) ref.